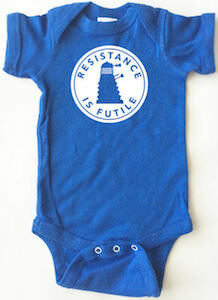 This Dalek baby bodysuit is just what a Doctor Who fan with a new baby needs. You can get this baby bodysuit in many fun colors and sizes going from newborn all the way to 24 months. On this Doctor Who bodysuit you can see a white circle with in the middle a picture of a Dalek and around it the text “Resistance If Futile” and that is not only true for Daleks it’s also true for parents when their baby cries. A cute bodysuit like this is just what you need to add to your child’s wardrobe because soon you will figure out that you can never have enough baby clothes. 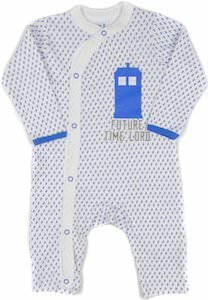 Now your newborn baby can wear a cool bodysuit to show the world that it is ready to do some exterminating and to become a Doctor Who fan. This snapsuit is made from 100% cotton and is black. 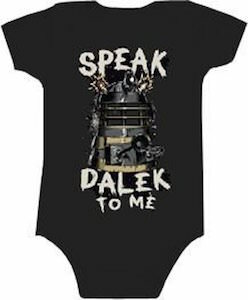 On the front of this bodysuit you can find the text “Speak Dalek To Me” together with a big picture of a Dalek and this Dalek is ready to teach your child how to do some exterminating. This Doctor Who bodysuit comes in sizes 0 – 24 months and will be something only a true Doctor Who family will buy for their toddler. 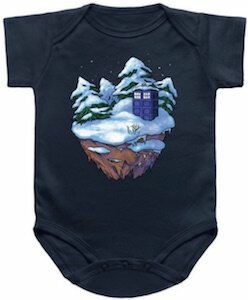 Prepare you child for the world of the Doctor with a bodysuit like this one.